Emma took a walk along the Susquehanna River this weekend and came home with pockets full of rocks. But this little shell was hiding in there too, when she unloaded her stash on to the living room floor for me this morning. 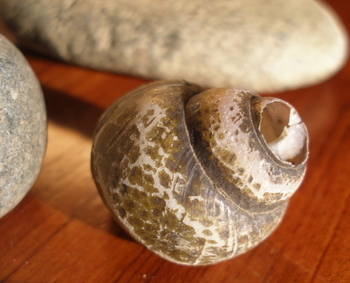 Each rock had a unique characteristic that attracted her to it: chocolate brown, looks like an egg, shaped like a "pickle", flat and smooth, shaped like a little bowl….Of course, now she wants to paint on these naturally beautiful little rocks, but we’ll see. I’ve got her into water colors right now, hoping to fill that "painting need" for one more day and put off painting this little collection. But if she’s so inspired, what can you do, really? My mini-boden catalog came in the mail yesterday. I LOVE this catalog. I get so many ideas from it. I have a little folder on my desktop that I dump tee applique ideas into. These fish and teacups are definitely going into that file. I love these pleated skirts and they remind that I really need to brush up on my sewing skills. I feel like what I really need to do is just start from the beginning–you know, take it from the top! I want a stronger foundation to my sewing skills. I remember when I was younger, in my 4-H days, I used to go to Mrs. Diefenderfer’s house every Saturday morning for sewing lessons. We were making a drop-waist jumper out of light blue and white striped fabric with big pockets on the sides. I’m sure the stripes were going the wrong way, but I do remember turning them the opposite direction for the pockets. So fancy, I know. You can say it. Unfortunately, I didn’t retain much from those lessons except that I remember her glasses made her eyes look really huge, and my jumper got a second place ribbon at the fair. These tees are enough to make me want to start woodblock printing. Although I’m feeling spread a little thin these days in the craft/blogging for "clients" department. Maybe we could duplicate with potato-printing at the kitchen table? No extra purchases or skill sets required. Basically, I want all of these things in my size. One for the girls, one for me, please? Flipping through the catalog last night reminded me of another project that’s been on the backburner. I’ve been wanting to do my pillowcase dresses again. But this time I want to do a short blouse version that the girls could wear over a long sleeve tee. Alright, time to push back from the laptop and go do some damage control–Emma has art supplies strewn all over the floor and Mary is attempting to wash dishes at the kitchen sink. "I need a new shirt!" Could be getting messy, I presume. Oh, do I ever love those pillowcase dresses (and I have a little guy so whatever will I do?). I’m thinking you just have to let Emma paint, paint, paint… It’s an excuse for yet another rock walk! i agree – i love those tops! oh, yes, i’ll take one of each too. lovely, all. good luck with all the projects! 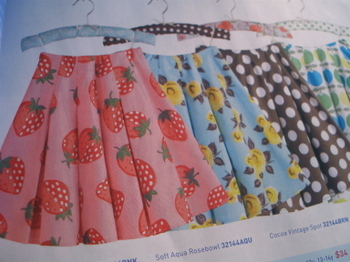 I love mini-Boden but is so expensive over here.Those skirts are adorable. Pillowcase smocks are a fabulous idea. I wish I could just find a decent thrift store around here. 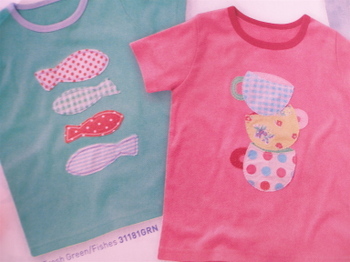 oh, molly, i got the catalogue yesterday too….too many cute things! there are all kinds of ideas swimming through my head. i just wish i had all the time! Molly, are you reading my mind? 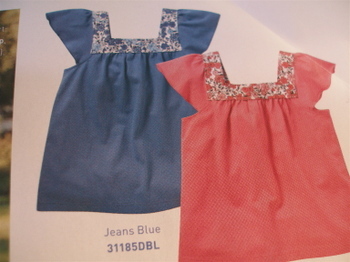 I just ripped out a bunch of pages from the miniBoden catalog…all in the girls section. =) A fish applique shirt is in the works for the boys. Can’t wait to see what you whip up for the girls. 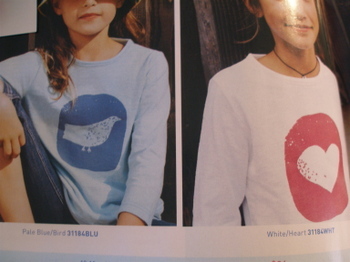 oh that miniboden catalog. we have pages of it strewn all over the place! apparently i need to get on some more catalogue lists. I too, got my minidboden catalog yesterday and hubby tried to hide it from me knowing that I’d be making trip after trip to the fabric stores as I’d be drawing up patterns for some of the clothes they have to make them cheaper. love reading about what’s going on around your house. the craft scene you described sounds alot like my house. can’t wait to see the pillowcase shirt.great catalog, never heard of it, but must check it out! I love mini boden (and big boden too!) but as I don’t sew clothes I actually buy the stuff (am I a sucker or what?) and I have already ordered some of the tops you had there!!! My daughter actually took the catalogue to school today for her “book in a bag” reader (and she’s only 6!). Love to see what you and your girls are up to. You poor thing with the tire…it all becomes too much when you’re pregnant, doesn’t it. What fabulous inspiration! I’m loving the woodblock prints. Put me down for one of those last tops in blue. Love it! Where along the Susquehanna do you live? It runs through our town in PA.
Mini-boden I am ashamed to say I haven’t heard of it. Wonder if I can get it in Canada? I love the applique t-shirts. The heart and bird you might do in Freezer paper stencils? I am addicted to freezer paper stencils. it’s very easy to make! i’ve made a few. there’s different sleeves and collars available. Oh I left my comment on the wrong BLOG. I still love the skirts. I’m new to this! LOL! hilarious! I was laughing out loud when I saw the pictures you had ripped out. The exact same ones I ripped. I do it everytime I get there catalog and then I paste them in a book for inspiration. I also got some good ideas from the adult catalog this time.